Most visitors to Sikkim will arrive from either Bagdogra Airport, or NJP Train Station, both located just south in West Bengal. It take around 2 hours from both travelling to the hill station of Gangtok which is the popular destination in Sikkim and base for further travel. The taxi fair from Bagdogra airport was 1,200 RP on our visit, the return journey 1,400 RP. These prices should be similar with NJP Station. For entry to Sikkim an Inner Line Permit is necessary but can be picked up easily on arrival at the border crossing (Here for full post on travel to Gangtok). And of course there are options of Sikkim Tour Packages. So our visit was during low season (September) meaning we did miss out on snow caps and mountain views vistas, which tend to be the top attractions in Sikkim for most. Instead we are surrounded by fog which in itself was a unique experience. So to see Kangchenjunga’s snowy peaks (the world’s 3rd highest mountain) travel is best between October and June. Otherwise there is plenty to explore at all times of the year. For this we have picked five of our own Top Attractions in Sikkim. Also, between attractions we find many lesser experiences along the way. 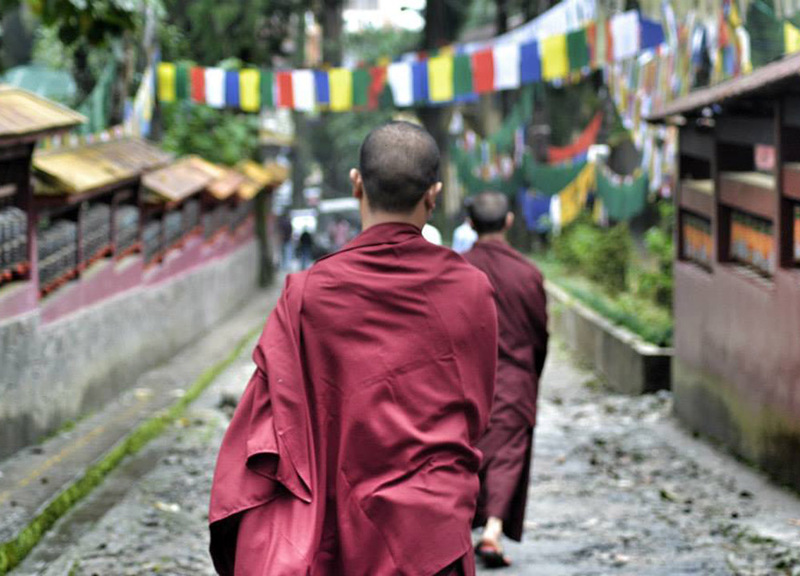 Expect Himalayan viewpoints, Tibetan Monasteries, intriguing local life and all sorts of unique Himalayan experiences. Note, Sikkim is not so different to the better known regions surrounding; Nepal, Tibet and Bhutan. only the top attractions in Sikkim are almost untouched by tourism. Gangtok is the best place to base travels and of course everything is there to help tour the top attractions in Sikkim. Here we rent a private car, with driver, for around $30 – $40 a day then, with their help, we draw up some exciting itineraries. So Gangtok itself is worth exploring and most will start at the New Market area of M.G Marg (Mahatma Gandhi Market) which is the pedestrianized centre, where all the tour offices are. 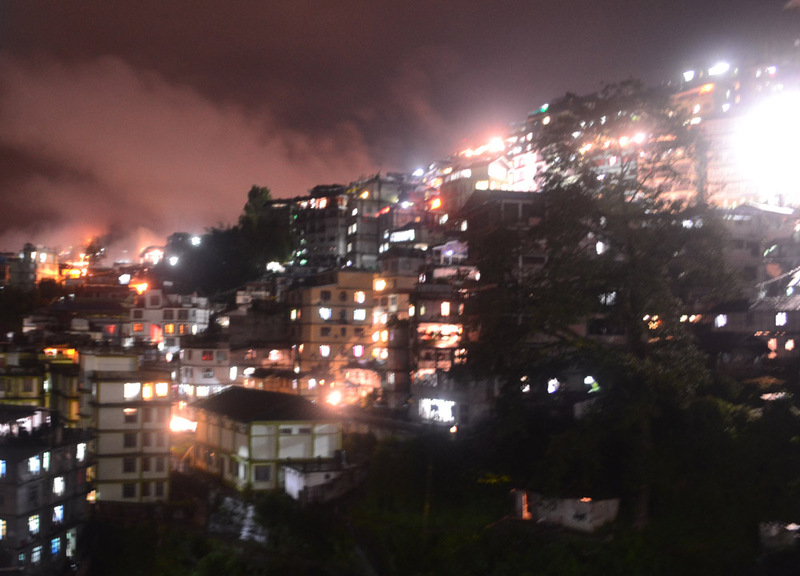 As a hill town Gangtok is steep stepped with lanes adjoining the central market area to other central parts of Gangtok, like Lal Market / Old Market. It is also small and simple to navigate as expected. The central taxi stand is found on the main road which passes through Gangtok near the entrance of the pedestrian area. Gangtok is no doubt unique once a British trade town between Tibet and the lower lands of India, and now brings an odd mix of familiar and unfamiliar. It is uniquely multicultural with an ethnic Nepali majority, dabbles of Bhutan, Tibet (Bhutia) and Indian Bengal. Also the occasional British influence. Here for full post on Gangtok. Enchey Monastery makes for the perfect introduction to the unique Tibetan Buddhist cultures in the region and while it doesn’t rank high with many top attractions in Sikkim, we were happily surprised by it. Enchey is one of the smaller monasteries of Sikkim, hidden snug between trees in the back hills of Gangtok, and staying in Gangtok it is simple to reach. 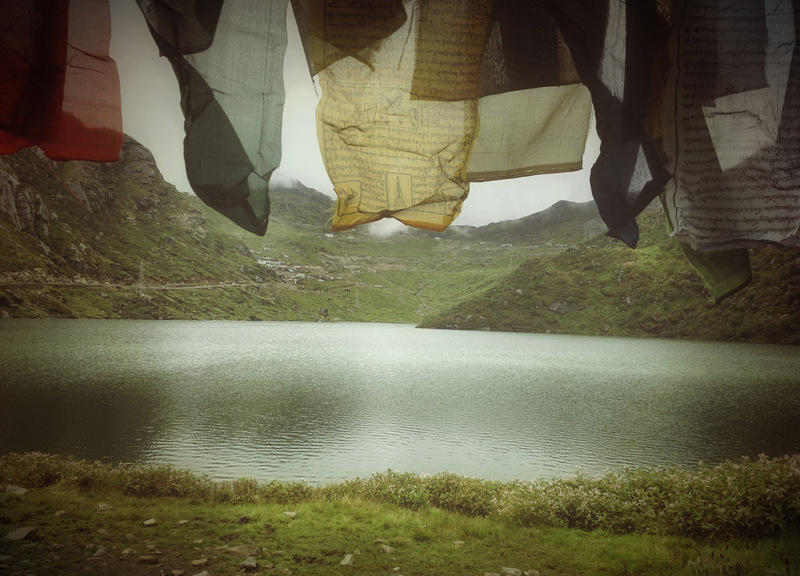 We arrive to find enchanting scenes at where Gangtok locals circle the compound, spinning prayer wheels under lines of shimmering prayer flags and a hazing mist. Tibetan monks appear and disappear from the surrounding housing and forests, and Buddhist chants echo from the central building where Tibetan Monks are in prayer. Enchey Monastery is peaceful, serene and enchanting. Also next to the central temple is a school for young monks where the robed kids sit outside to learn to read and write Tibetan scripts. 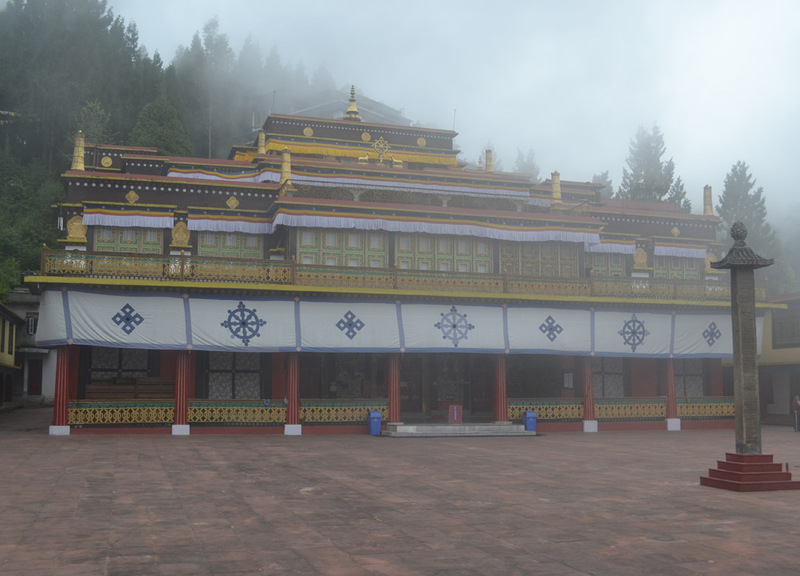 If planning a visit to Enchey Monastery it will take a quick 100 RP (or less) taxi from Gangtok centre. For a hotel nearby we stay at the Hotel Mount Siniolchu situated just below. Here for full post on Enchey Monastery. Rumtek Monastery was a very different experience to Enchey Monastery, found remote in mountains, while Enchey hides in a local forest. What stands out however was the security at Rumtek Monastery with passport check at the front gate and a 5 minute walk (up hill) to further security. Then the metal detectors on entrance and the armed guards. 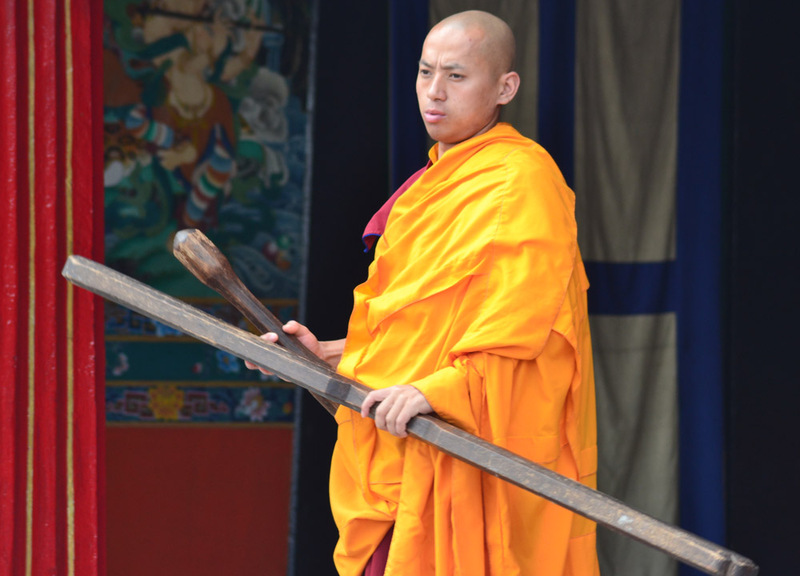 The reason for this slightly over-the-top security is to prevent violence between opposing monks in the area where, in the past, there has been pitched battles between two factions of monks who both claim ownership. Those currently inside Rumtek Monastery are Karma Kagyu monks who currently wait for their leader who has been forced into exile. Away from the obvious security issues the monastery is impressive and again we find it shrouded as fogs fall to blanket the buildings. Behind the central monastery is the dining hall, living quarters and the housing of the Golden Stupa (which was closed during our lunchtime visit). We again just circle the area and compound spinning prayer wheels and watching the monks as they go about their day. Here for full post on Rumtek Monastery. For me, getting to Changu lake was the fun part; bumpy, dangerous, exciting and adventurous. The road there follows the ancient silk routes winding through bumpy roads, up and further again, above the clouds and keep on going. We pass endless mountain landscapes dotted with mountain goats, army camps, yak herders and local labourers who chip away at the mountainside. Changu Lake is high, 12,310 feet high, and in the better months of the year it will be iced over and surrounded by snow-capped peaks. Travelling in Low Season we just see a lake, albeit a beautiful lake. The area is geographically interesting, where a short distance further finds Nathula Pass and the Tibetan borders which are known for regular standoffs and skirmishes between armies in the past. The borders of Bhutan are also not so far. For bites and trinkets at Changu Lake there’s a small village just before the entrance which caters to those few visiting the area. There is also a nomad at the lake who leases rides on his Yak around the perimeter (at extortionate tourist prices). Also expect the Himalayan cliches of kids playing cricket, mountain goats butting heads etc. Changu Lake is always one of the the top attractions in Sikkim, but during low season, with the necessary documentation, regulations, potentials for landslides, and requirement for not only a driver, but a local guide… It can be tricky to organise. Here for full post on Changu Lake. While lesser known than the Assam and Darjeeling tea plantations from the lower lands of the Himalayan foothills the Temi Tea Gardens are hard to beat when it comes to scenery. At 7,000 feet these uniquely Himalayan tea hills are well worth the three hour drive from ‘nearby’ Gangtok, but I would recommend staying onsite at the Cherry Resort. The area is no doubt remote and during our time there we see no tourists whatsoever. The hotel is completely empty at this time of year. Shortly after sunrise, each morning, the locals in the area descend from small settlements in the nearby hills to start their workday picking tea on the steep slopes. 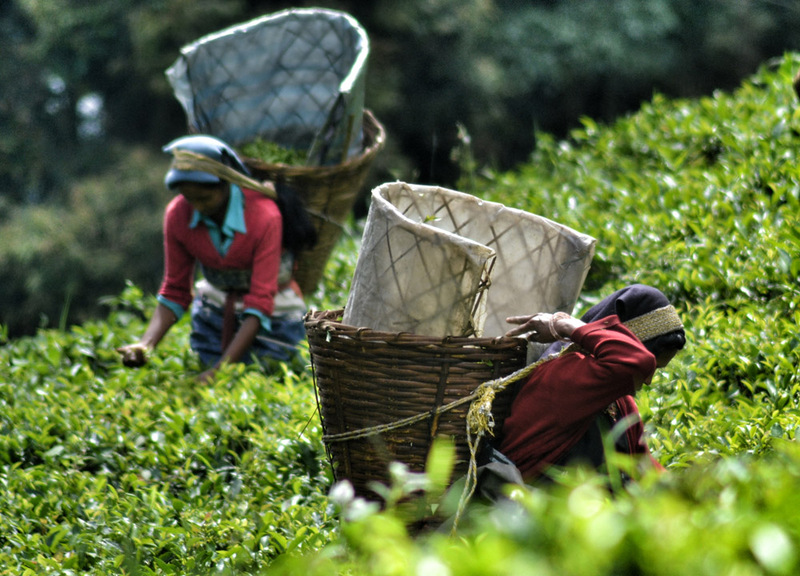 Both women and men navigate between tight lines of tea bushes from 7am – 4pm daily plugging the ripe tea and tossing the leaves over their shoulders to large baskets fixed to their backs. Tea picking starts in the lower tiers of the Tea Garden and gradually climbs to the top. The Temi Tea Factory is also in this area, but it doesn’t normally take tours. On my visit, after a bit of pestering, we manage to force a tour inside. Here for full post on Temi Tea Gardens. Follow out Top Sikkim Attractions and many more of our Sikkim adventures in our video diary below. Expect Himalayan viewpoints, lesser known Tibetan Monasteries and intriguing local life. Nice images. it shows there trends and culture. thanks for sharing nice views. You had me with the photo of the monks’ backs. Beautiful and intriguing. Can’t agree more. I see monks on a daily basis yet the Tibetan Monks will always fascinate me. 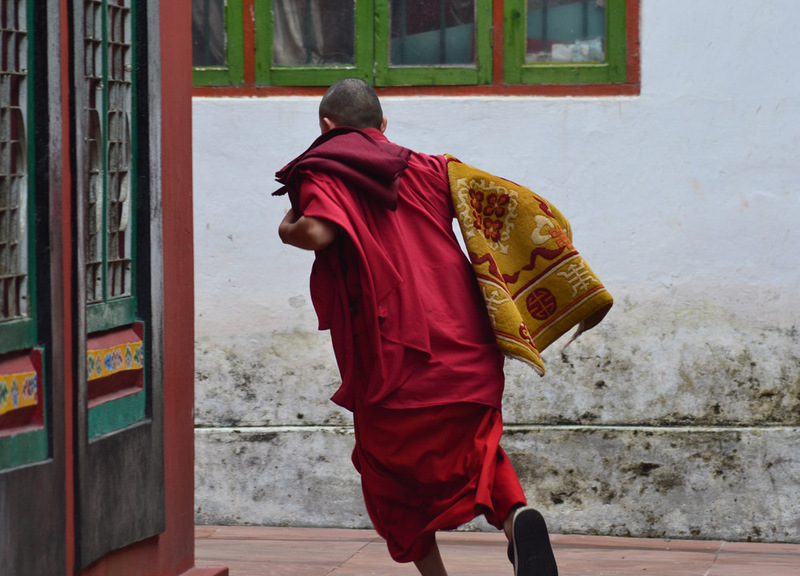 So many gorgeous photos and all I canthink of is: why is that monk in such a hurry?